For almost 20 years, IBCCES has been the industry leader in autism training for licensed healthcare professionals and educators around the globe. IBCCES recognized that many families with children with special needs have limited options and created programs specifically for the hospitality and travel industry. Johnny Morris’ Wonders of Wildlife National Museum and Aquarium consists of an all-new 1.5-million-gallon Aquarium Adventure showcasing 35,000 live fish, mammals, reptiles, amphibians, and birds, and immersive Wildlife Galleries that bring visitors eye-to-eye with the greatest collection of record-setting game animals ever assembled. Created by noted conservationist and Bass Pro Shops founder/CEO Johnny Morris, the 350,000-square-foot experience celebrates those who hunt, fish, and act as stewards of the land and water. Located next to Bass Pro Shops National Headquarters in Springfield, Missouri the campus is a centerpiece of America’s Conservation Capital in Missouri’s Ozark Mountains. Wonders of Wildlife has been voted “America’s Best New Attraction” and “America’s Best Aquarium” by the readers of USA TODAY. For more information, visit www.wondersofwildlife.org. 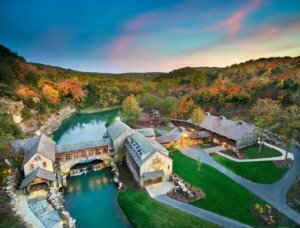 Dogwood Canyon Nature Park is a 10,000-acre slice of alluring Ozarks paradise located in Lampe, Missouri. The vision of Bass Pro Shops founder/CEO Johnny Morris, the not-for-profit park serves as an outdoor playground dedicated to connecting families with nature while conserving the rich history and natural beauty of the Ozarks. The park offers hiking, biking, Segway tours, wildlife tours, horseback riding, and trout fishing set against a backdrop of towering bluffs, waterfalls, spring-fed creek beds, and wildlife such as American bison, Rocky Mountain elk and white-tailed deer. The park also features a fully restored working gristmill, museum, restaurant, and conservation education center that connects to a treehouse built by Animal Planet’s Treehouse Masters. For more information, visit www.dogwoodcanyon.org.